Warner has released an online promo for the upcoming Blu-ray release of 'Batman: Gotham Knight,' providing a first glimpse at the disc's extensive bonus features. As first announced this past February, Warner Home Video will debut the direct-to-video title on Blu-ray July 8 (day-and-date with the standard DVD). A three-minute video clip posted on the title's official website give a first peek at the highly-anticipated Blu-ray release, previewing comments from the film's cast and crew regarding the film's inspiration, revealing some of the disc's supplemental features, and showcasing further behind-the-scenes footage. 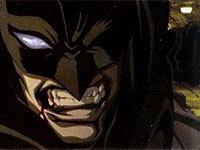 The clip is available to watch now (via streaming video) at the Batman: Gotham Knight official website. Warner has not yet announced tech specs for 'Gotham Knight,' but we'll keep you posted. Suggested list price for the Blu-ray has been set at $34.98. As always, you'll find the latest specs for 'Batman: Gotham Knight' linked from our Blu-ray Release Schedule, where it's indexed under July 8. We've also set up a dedicated thread for Warner Premiere's latest in our Forums area -- click the following link to discuss the 'Batman: Gotham Knight' Blu-ray release.